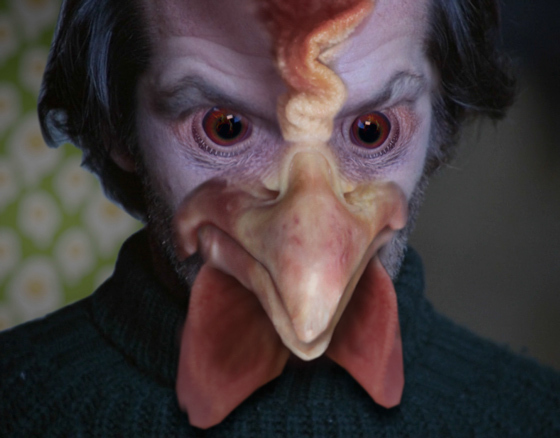 Be it a mash-up or digital graffiti or a video remix (whatever you call it), Nick DenBoer and Davy Force's The Chickening is an orgiastic ocular onslaught. Having premiered at the Toronto International Film Festival this summer, the reimagining of Stanley Kubrick's The Shining made its way to Edmonton's Dedfest, a gem of a film fest located in the Gateway to the North. The eye-pleasing short took some of the audience by surprise with its quick pace and WTF-worthy laughs. Having worked together for Conan O'Brien in various video forms, DenBoer and Force spare no frame in this retelling of the 1980 classic. Trying to describe this frenetic, five-minute short is comparable to trying to teach a manatee to fix helicopters, as the level of detail in each scene is dazzling. With that said, having a pause button sure helps the sheer minutia of it all set in. The story: Jack Torrance is the night manager of Charbay's Chicken World and Restaurant Resort. As in the original film, Torrance starts to lose his grasp on reality, but in this case, instead of just trying to murder his family, he morphs into a flesh-hungry chicken with the help of a special drink from Lloyd the bartender/restaurant attendant. The rest becomes un-cooped fairly quickly. Meanwhile, the Grady twins are a rap-tastic electro-duo who try to taunt the young Danny Torrance into playing with them; Skatman Crothers is a dim-witted pickle alien; and as for the lady in the shower, well, Kenny Hotz makes a cameo and is equally creepy. Throughout, DenBoer and Force embrace the ridiculous, comically modernizing a classic while not diminishing it. Be it giving Tony (the little boy who lives in Danny's mouth) a face, mashing together old dialogue with the new (with the help of voice magician Tim Beresford), or using most of Jack Torrance's craziness in a commercial for Charbay's, the two show a thorough understanding of the source material, and use it to their advantage, inviting Shining fans in on the joke, rather than alienating them.